The Winnipeg Jets were able to bounce back against the St. Louis Blues on Sunday, taking Game 3 by a 6-3 margin for their first win in the series. 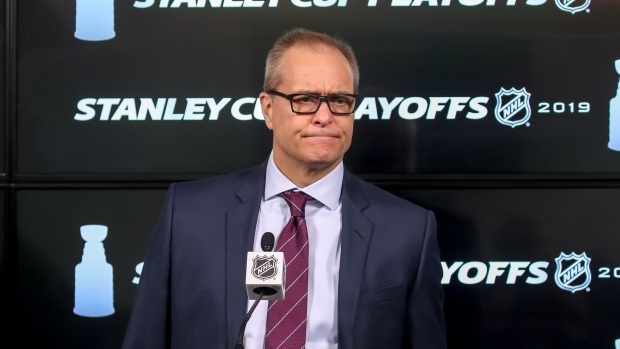 Paul Maurice must have been feeling pretty good after the game, and he had a swift and good-natured response when his post-game press conference was derailed by an ad for a local hardwood flooring company. Oh, that Paul Maurice. He’s a funny guy, although if the Jets had lost this one and gone down 3-0 in the series, we wonder what his reaction would’ve been like then. But he’s always down for a good laugh while speaking to reporters, too! Funny moment during #NHLJets coach Paul Maurice scrum here in Washington. Talking about Patrik Laine playing on the top line. “If you want to play in the A-hole...I can’t use that...if you want to play on the A-line...wow. Ok, we’re done here today.” Walks off, laughing.